Tall Tales Productions: I'm not dead. 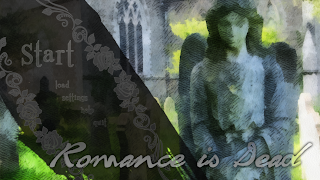 But Romance is. I'm not dead. But Romance is. 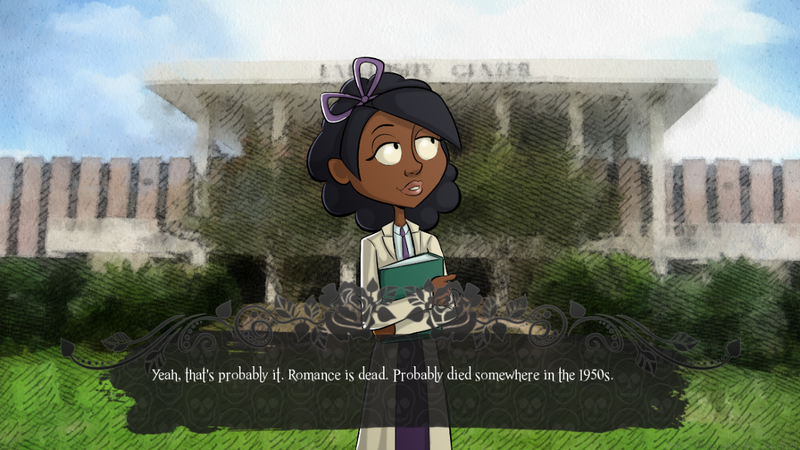 Romance is Dead is a short, slightly macabre and very cute story about... well, life, death and everything in between these two. 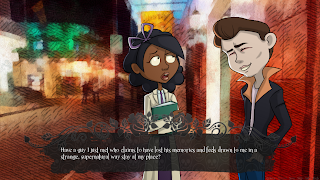 It takes place in the city of New Orleans, one late October, disturbingly close to Halloween, when, as everybody knows, things tend to happen that somehow breach the boundary between this world and the next. Thus, the title screen displays a graveyard. Adam looks a little like James Dean in his prime, and his behavior and speech only add to that picture. He claims to feel inexplicably attracted to Maddie, which is one of the stranger pickup lines she has heard - especially since Adam doesn't seem to really want to pick her up. Or... does he want to, and it's just a very clever act? Don is one of Maddie's fellow students, a genuinely nice young gentleman who treats her with the utmost respect. He studies engineering and would be the most normal, unassuming of the three people Maddie meets if he didn't have... well, a lack of physical presence in general and a lack of lower body in particular. And an interesting history to go with that. 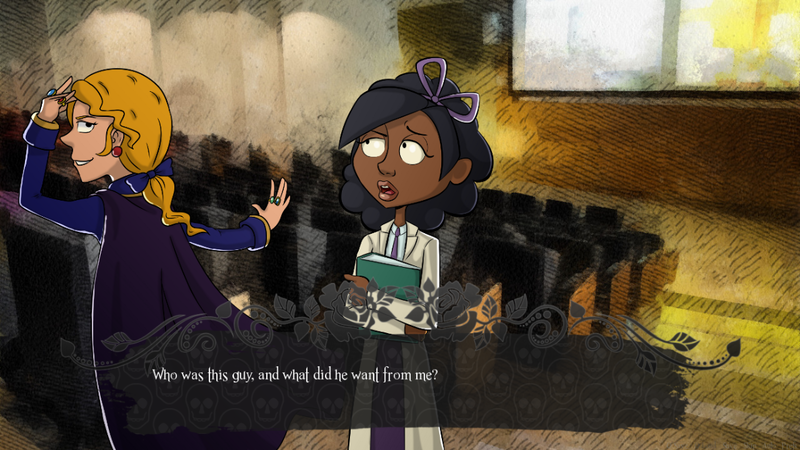 All characters were designed and drawn by the incredibly talented and fast Card-Queen of the Lemmasoft Forums. 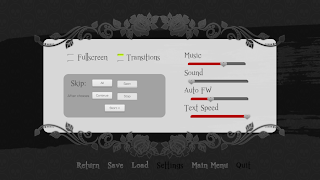 I usually don't make a lot of fuss about the user interface, but this time, my UI artist Luce Jumble really outdid herself. I mean, even our settings screen looks amazing! 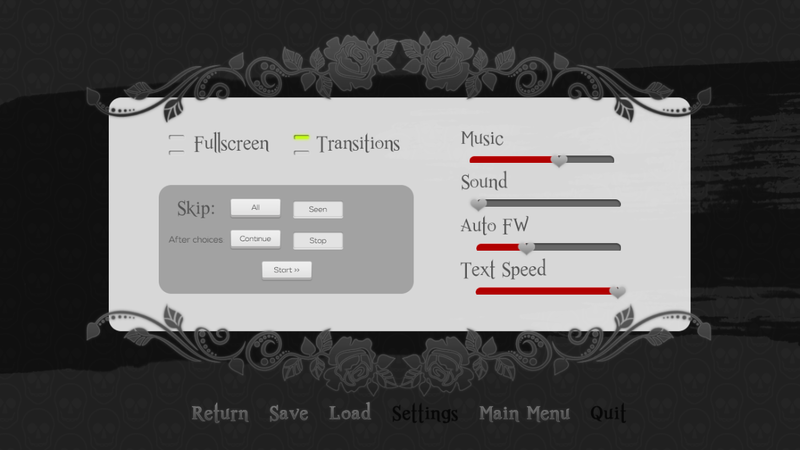 Have you ever seen a so tastefully macabre settings screen such as this? 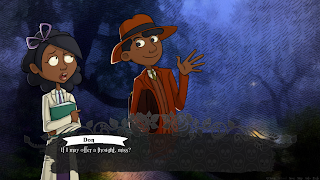 With such beauty for the eyes and a wonderfully morbid dark jazz soundtrack, Romance is Dead may not be my longest or my best work yet but certainly my most stylish. Download it here - as with most of my works, it's free! The file asks me for a passsword.